NAR PULSE—Your next NAR Member Value Plus (MVP) Program reward is here! 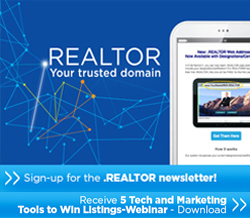 Members who sign up for the .REALTOR email newsletter by Aug. 15 will earn free access to 5 Tech and Marketing Tools to Win Listings Webinar – Download and be automatically entered to win a $50 REALTOR® Store gift card from MVP. Act now to ensure you are maximizing the benefits of your .REALTOR web address. NAR members receive a $500 cash allowance toward the purchase or lease of the all-new Jeep® Compass and other vehicles from FCA US LLC. Equipped with clever functionality and advanced technology, the Jeep® Compass is perfect for business or leisure. REALTORS® get two years of no-charge oil changes. Learn more. Optimize your social media and online marketing with the newly updated Social Media for REALTORS® series from the REALTOR® Store. This series is ideal for helping you connect with the next generation of homebuyers and sellers. Use code SM17M for 15 percent off your purchase through Aug. 31! Save now.